Flocks of bronze, red, and green dragons were hurrying towards Zin-Azshari. The planet, life on which they had been sustaining for many thousands of years, was in a grave danger. Archimonde had already defeated Malorne and Sargeras lacked mere minutes to pass through the portal and bring an end to everything living. The aspects had to take over Dragon Soul to finally stop Burning Legion. There it is — above the very surface of the Eternity Well, shining like the Sun, gleaming the coming of the fallen Titan. But the dragons couldn’t take it. Sargeras knew somebody would interfere with his plans and had cast a protection spell around the Eternity Well. In addition, bats of the shadow mounted by captain Varo’then and other soldiers of Azshara’s guard became yet another obstacle on the dragons’ way to the golden disk. Meanwhile, a huge number of independent happenings were determining Azeroth’s destiny. And it seemed that the destiny would come with the first thing to happen. Sargeras was working on the last incantation that would bring him through the portal; Illidan, who had been swearing Tyrande to save Azeroth, was bringing his plan to life; Malfurion on top of Alexstrasza was fighting with Varo’then hoping to take the disk over; Deathwing having suddenly flown to the battlefield, obsessed with his loss, was trying his best to break through the protective charm and take over Dragon Soul as well. But as it usually happens, not a single event but a set of all of them determined the future. Deathwing succeeded in trespassing the protection spell and for a single second owned the artifact again; Sargeras watching the black dragon’s success with a sheer force of will beat the disk from the dragon’s paws; Malfurion was just in time to catch the falling disk after he destroyed Varo’then; and Illidan by a powerful incantation created a whirlpool in the middle of the Eternity Well. Everything not belonging to this world: demons, doom guards, feel hounds, Mannoroth, and even Archimonde — disappeared in the whirlpool. The evil always leaves marks. The Well of Eternity after consuming the demons exploded and divided Kalimdor into 4 parts. The capital of the high elves drowned itself under the water of the outer ocean and Azshara became one of Naga in return for immortality. The three aspects decided to deprive Demon Soul of its destroying power. They cast an incantation impeding any dragon from touching the artifact ever since. But it turned out that even in such situation Illidan had not played his whole role yet. Seconds before the Well exploded Illidan had filled several vials with its magical water. He could not stand being mortal and deprived of his magical powers. The night elves were too late to take Illidan. He had already poured the water into a lake on top of Mount Hyjal. 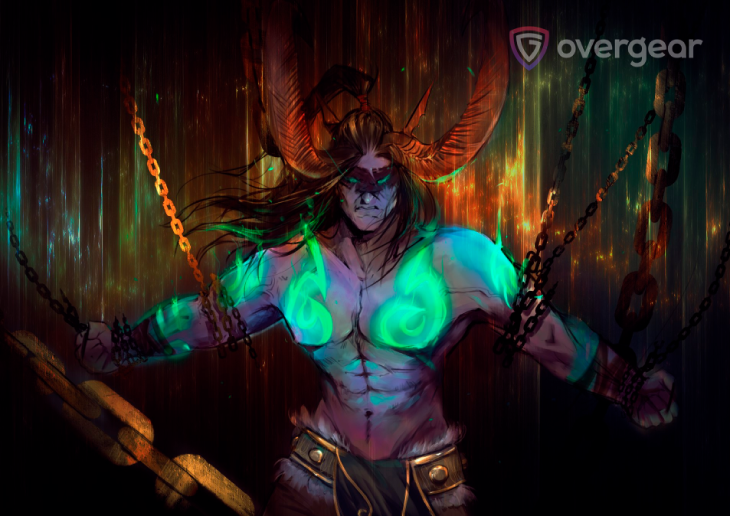 As a punishment, Illidan was put into prison, but a new source of power appeared nonetheless, meaning the evil could disturb the peace once again.